Stars are like people. There are big ones, small ones, bright ones, not so bright ones – small ones are usually the brightest but the big ones are the scariest! They are all different and they come in a variety of colours. The majority are not alone, most have a companion and some live in families. Our Sun is unusual in being an “only child” of a star but at least it has us to keep it company. Looking overhead as soon as it is dark enough, you can see one of the brightest stars in the sky, Vega. It is a bit more than twice the size of the Sun but hotter and very close being only 25 light years away. Look to the left though, and you will see a very different star. This is Deneb, sitting at the tail of the constellation Cygnus. It looks to be a similar brightness to Vega but it is much, much further away at an amazing 1425 light years. So you can see that it must be a great deal bigger to appear so bright. It is, in fact, one of the largest stars in our galaxy and if you placed it in the middle of our Solar System, the Earth would be grazing along its surface. It is thought to be nearing the end of its life and likely to explode as a supernova relatively soon. Of course, “soon” in astronomical terms means anytime in the next few million years. Looking to the south, below Vega and Deneb is another star of similar brightness, making the “Summer Triangle” with them. This is Altair in the constellation of Aquila, the Eagle. It is the closest of the three, at 16 light years, and the coolest, although still hotter than the Sun. Like Vega, it is spinning on its axis at a very high rate, about 200 times quicker than the Sun, but unlike the others, it is travelling across the sky at high speed. It is the fastest moving star known, but it would take several thousand years for you to notice. Now, Vega is known to be alone; if Deneb had a companion, it probably swallowed it, and Altair has probably run away from any partner – but down near the horizon is a regular little family of stars. 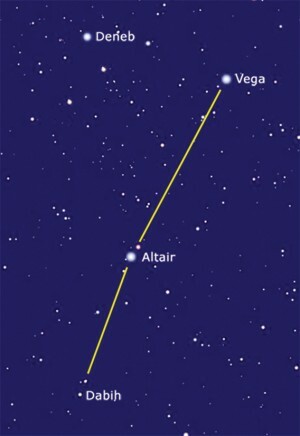 Imagine a line from Vega down to Altair and continue it almost as far again to the constellation of Capricorn and you should see two faint stars, the lower one brighter than the other. They are tricky to see so it may take a while but the lower one is, possibly, the most fascinating star in the sky. It is called Dabih and has long been known to be a double – that is, two stars orbiting each other. Each of these has been found to be a double and at least one of these is a double. So, we have a group of at least five stars, all orbiting each other at different rates and all different to each other. The view from any planet in the system would be amazing but it would probably never get dark. There could be some very tired aliens out there feeling very envious of our lengthening nights!